Have you ever considered the power of the perception of institutional choice? If students want to be at your institution—if you are their first choice — they are more likely to have higher satisfaction with their overall experience. If they indicate that you were their second or third choice, their satisfaction scores are lower overall. This insight was first shared ina blog I wroteon the 2018 National Student Satisfaction and Priorities Report when it was released last fall. The 2018 Report looks more closely at the differences in student satisfaction by a variety of demographic subpopulation indicators, including self-reported institutional choice. As previously noted, the good news about institutional choice is the perception of institutional choice is something we can potentially influence as we are working to recruit and retain students on our campuses. This in turn will help to improve overall student satisfaction. This is important because we know from theresearchthat student satisfaction is linked to higher individual student retention, higher institutional graduation rates and higher institutional alumni giving rates. 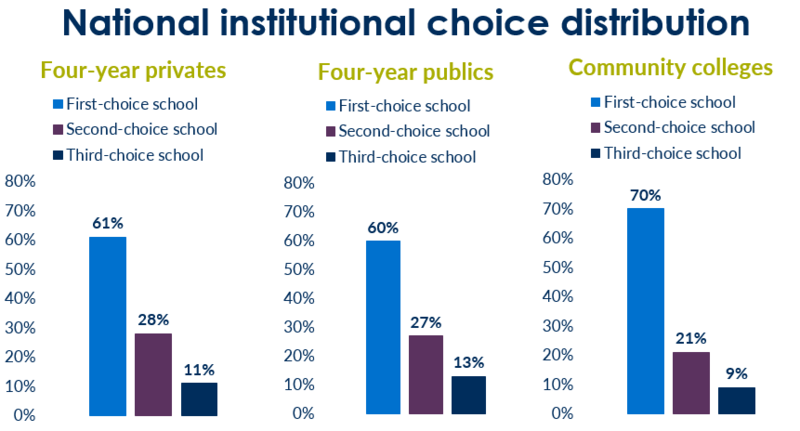 How likely are students to be attending their first institutional choice? Do you know how many of your students believe your institution to be their first choice? (If you have recent results from an administration of theStudent Satisfaction Inventory™, check the demographic report section for the answer to this question). Where are second- and third-choice students less satisfied? It is an enjoyable experience to be a student on this campus. These students are also more likely to reflect lower satisfaction with the admissions counselors accurately portraying the campus during the recruitment experience. Second- and third-choice students at community colleges had lower satisfaction on similar items. What can you do to influence institutional choice? 1. Be aware of your students’ perceptions of institutional choice. Track this information from yourStudent Satisfaction Inventoryresults, or have some other method to capture it through the admissions process. Be aware of how this indication compares with your peer institutions and how if shifts over time. 2. Use communication to influence and change perceptions. I had a client say to me, “Institutional choice is a branding issue. We have to work harder at getting students to buy into the college.” This starts with how you position the college through the recruitment process and continues once the students get on campus. Act like a first-choice institution, and highlight the reasons why currently enrolled students feel you are the best fit for them. Emphasize the unique experiences that students can only have, or best have, at your college. Look for ways that you can attract the students who are excited to attend your college, by offering the right amount of financial aid and the right programs. Maintain your campus appearance. Put a strong emphasis on your campus climate by intentionally welcoming students and helping them to find where they belong. I encourage you to download the currentNational Student Satisfaction and Priorities Reportand take a closer look at the satisfaction findings across a variety of demographic variables, including race/ethnicity, class level, gender, age, employment, current residence, class load and educational goal. ACE Conference SessionI will be presenting on this topic, “First Choice Institution or No? 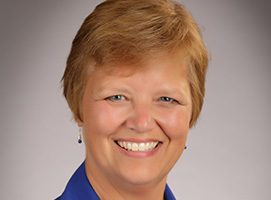 Why it Matters for Enrollment and Retention Success,” on Monday, March 11, at theAmerican Council on Education (ACE) Conferencein Philadelphia. If you will be attending the conference, I invite you to join the discussion during the session. Or if you would like to visit further about student satisfaction assessment on your campus,contact me directly anytime.